A layer, “roads” for example, is a group of objects representing a specific kind of map geometry. The layer class offers a wide range of graphic customization features along with downloading and filtering options. (enum) LayerType: the enum value of the current layer, Buildings, Landuse, Water, Earth, Roads. (bool) isPolygon: defines if layer’s data is composed by map polygons or lines. (roads are defined as lines with a width). (bool) useRealHeight: enables the 3D building feature (buildings only). 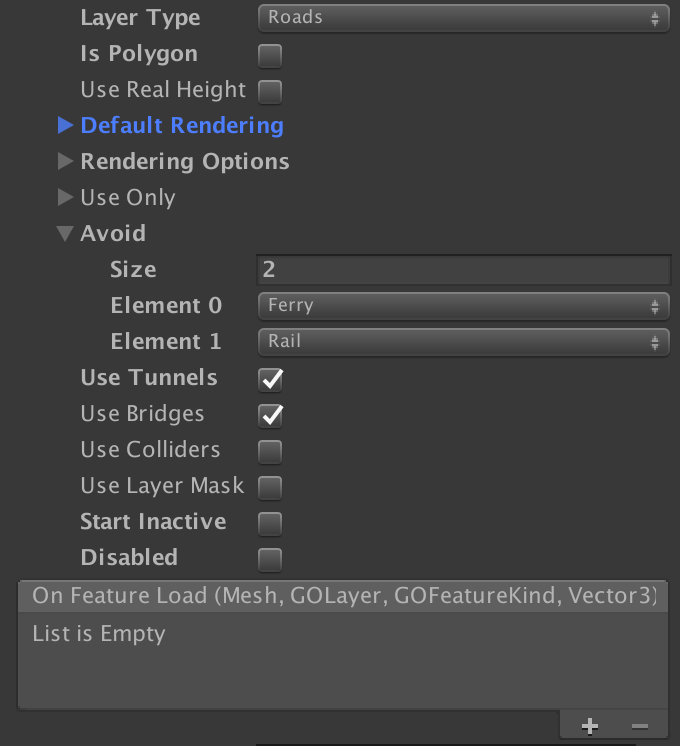 (RenderingOption) defaultRendering: contains all the default rendering options for the layer. Se the next paragraph for the “RenderingOption” class. (List<RenderingOption>) renderingOptions: overrides customization for special map elements. (GOFeatureKind) useOnly: use this list to select to render only specified kinds of objects. A list with a size of 0 means that every kind is rendered. (GOFeatureKind) avoid: use this list to select features kind not to render inside the map. (bool)useTunnels: flag on to show underground roads. (roads layer only). (bool)useColliders: flag on to add colliders on objects. (bool)useLayerMask: flag on to add objects to unity layermasks, named after the GoMap layers. Note that you’ll have to add layer masks manually to your project in order to make this feature work. (bool) Start inactive: the layer is downloaded and crated but set inactive (not visible). (bool) Disabled: the layer is not downloaded at all, so it is not created.